Conference Announcement: Evolution of Chemical Complexity: From simple interstellar molecules to terrestrial biopolymers”, Liblice Castle, Czech Republic, 13 – 15 September 2016. The meeting will try to map the chemical evolution of the molecular building blocks of life from their possible sources in the interstellar medium, the atmospheres of planets and on their surfaces. It also aims to serve to engage the astrochemistry and systems chemistry communities into a dialogue. 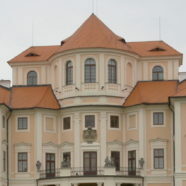 The meeting venue is Liblice Castle (http://www.chateau-liblice.com/), an 18th century castle in a wonderful park offering 4 star hotel accommodation, excellent meeting facilities in Baroque settings and excellent meals. The venue is situated only a 30 minutes’ drive from Václav Havel airport in Prague. A shuttle service will be provided on the arrival and departure days. Although the venue is very nice, the fees for the meeting are fairly low. These bursaries amount to € 60,- for each night between 12th and 15th September and EUR 20,- for each meal which roughly covers the cost of food and accommodation in single rooms at Liblice Castle. In addition the bursary includes a travel allowance of max € 300,- for economy class flights or equal surface transportation. These grants will be preferentially allocated to talk and poster presenters, early career investigators (up to 8 years after their first Ph. D.) and attendees from EU Inclusiveness Target Countries. Deadline for registration and abstract submission is 15 July 2016. We are looking forward to meeting you in Liblice.